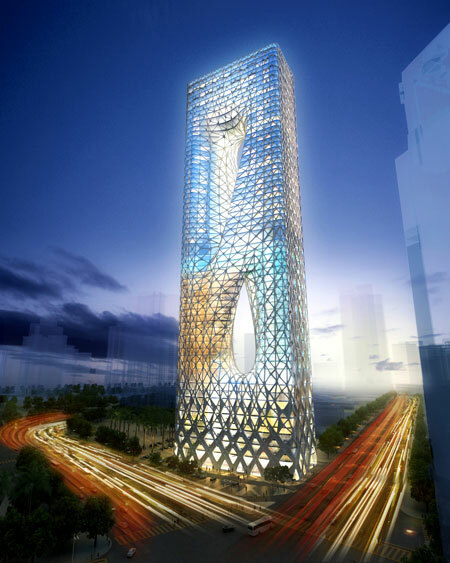 Zaha Hadid’s design for Sunrise Tower in Kuala Lumpur, Malaysia, engages with the city in multiple ways. By exploring potential synergies at different levels and anchoring itself to the existing urban fabric, it creates a platform of services that engage with neighbouring developments, sustaining critical mass and a sense of community. The scheme merges all programmes into one building, distancing itself from the traditional tower and podium typology. Through a detailed landscape strategy the design interweaves tower and ground, extending and connecting the different parts of the site, integrating the new pedestrian routes and internal road system, structuring the fabric of the new development. 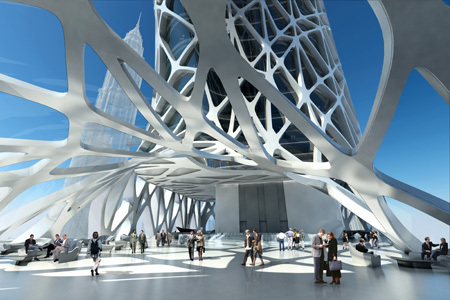 The building is designed through a series of independent flows that map the tower and organize different routes for different programmes. Along these routes the lobby and shared facilities floors work as communication hubs, like intersections that enable flexible itineraries and changes between uses. Similarly to the skin, the circulation materializes as a multi dimensional spatial grid, inclusive of the program, treating interior and exterior in a seamless way, thus maximizing the clarity of the scheme and the perception of the different levels. The design of a clear navigation system for lobbies, atria and common areas, enables visual communication as well as access through the cores, ensuring fully accessible environment for all users. 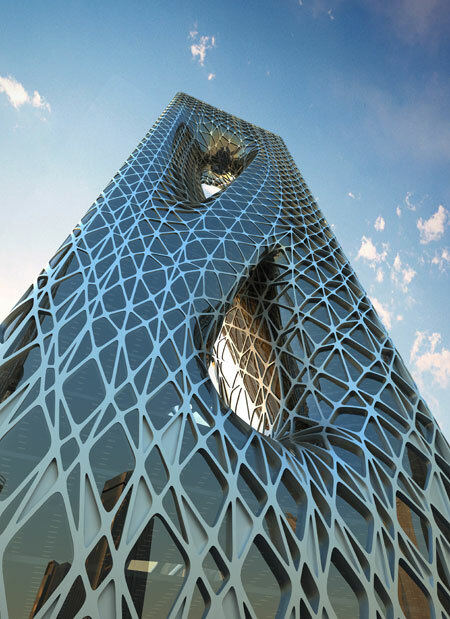 The building’s complex programme is distributed through 66 floors in total, 4 bellow ground and 62 above ground, with an absolute height of 280m. The ground lobby is the primary hub of the tower, defining 4 different dedicated lobbies for residential, hotel, offices and general public.